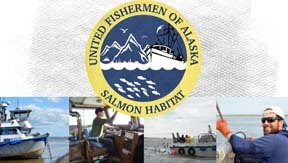 JUNEAU – UFA’s Salmon Habitat Information Program (SHIP) has launched two summer sweepstakes to connect with commercial fishermen for important information regarding salmon habitat. Winners will be selected from fishermen who enter the drawing through a text campaign or Facebook comments to win Alaska Airlines and LFS, Inc gift certificates. The statewide commercial fishing umbrella association United Fishermen of Alaska has released its updated set of fishing data sheets for major Alaska communities, boroughs and census areas. UFA is seeking to provide comprehensive information and statistics to help raise awareness of the importance of the commercial fishing and seafood processing industry to the state and Alaska communities.